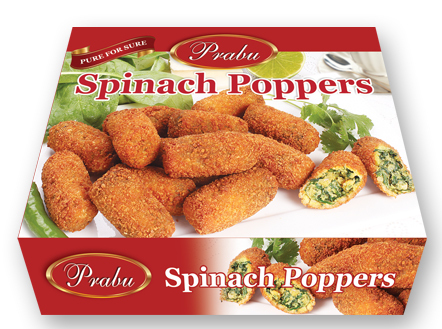 Spinach Poppers – An Indian delight, filled with cheese and spinach, then fried to perfection. Ingredients: Spinach, Potatoes, Paneer (Milk, Modified Milk Ingredients, Citric Acid, Calcium Chloride, Potassium Sorbate [Preservative]), Toasted Bread Crumbs (Wheat Flour enriched with Niacin, Ferrous Sulphate, Thiamine Mononitrate, Riboflavin, Folic Acid, Sugar, Yeast, Salt), Fried Onions, Chickpea Flour, Water, Corn Starch, Cilantro, Ginger, Green Chilli, Salt, Mango Powder, Cumin Powder, Black Pepper, Baking Powder (Corn Starch, Monocalcium Phosphate, Sodium Bi-Carbonate), fried in Canola Oil. 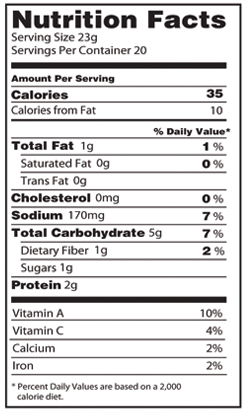 Contains milk produced in a facility that uses wheat, and nuts.